After a triumphant PR at the Wrigley River Run 5k Saturday morning, the Green Girl headed over to Palos Verdes with Lexa for a long ride. I was feeling more confident after my first cycling lesson so I decided I would go for an actual ride on the road. I parked, hopped on Lexa, and headed out along the coast. As I was riding, there was suddenly a loud popping sound and I heard Lexa's rear tire deflate. The tire was flat like a pancake. I looked around and saw what appeared to be the culprit, a menacing looking white rock with a wide, sharp edge. Relieved that this occurred so close to my car, I rolled Lexa back and drove over to the nearest bike shop, The Bike Palace. They propped Lexa up on a bike stand and removed her rear tire. They seemed impressed by the severity of the damage. The tire was sliced horizontally and would need to be replaced. Unfortunately, The Bike Palace didn't have any 650c tires, so they put the torn tire sans tube back on Lexa and wished me luck finding one in stock nearby. 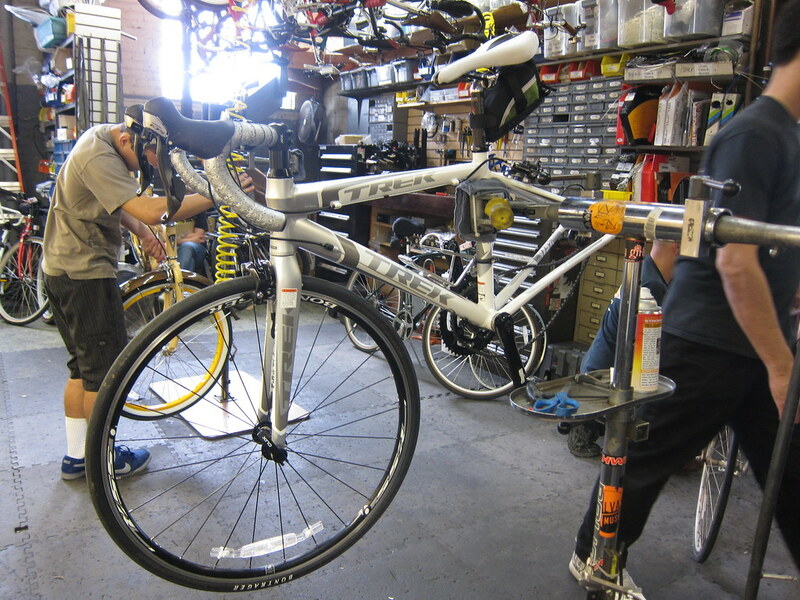 I managed to find a 650c tire in stock at Jones Bicycles in Belmont Shore so I headed back over the bridge. 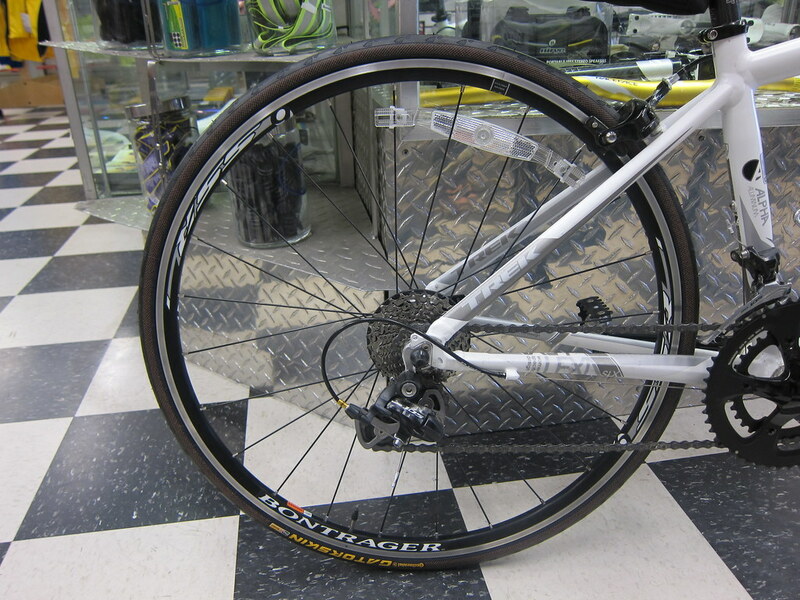 At Jones Bicycles, they had two replacement tire options. A standard tire for $14.99 and a Continental Gatorskin tire for $49.99. I was about to go with the cheaper tire when the salesperson mentioned the Gatorskin featured a Kevlar belt under the tread for cut and puncture protection. A half hour later, Lexa was a whole new Lexa with a $50 Kevlar rear tire. that stinks that it happened, but luckily it was by your car! Glad you were so close to your car when that happened. That is one of my fears getting into cycling. Nice new tire! Stinks you got a flat, but good it happened close to your car. It would really stink if that happened far from civilization. And congrats on the pr! shes no virgin now. :-) look for sales at bike shops in the future for 650 tires and just buy a couple to keep on hand for under $30.00 bucks. I'm impressed that you went with the gatorskin but I would had convinced you otherwise. 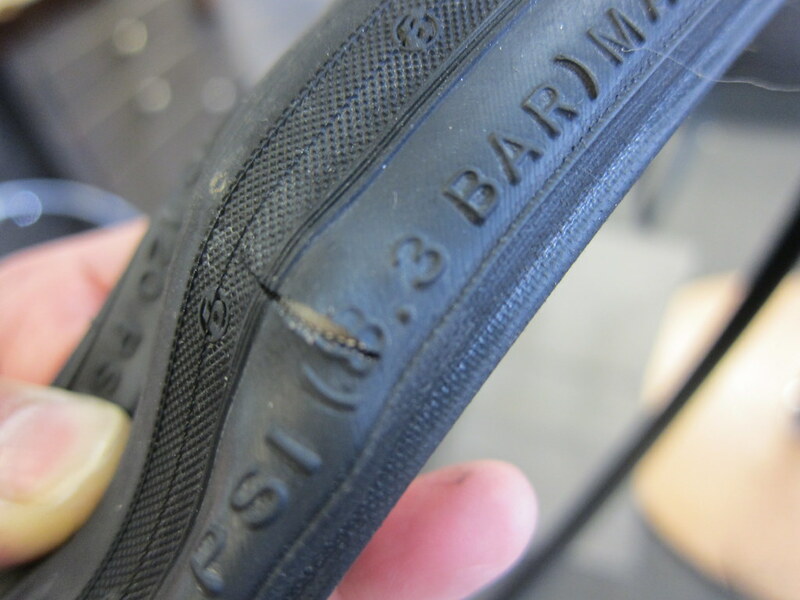 That particular slice in your tire may never happen again. Now with that being said, you need to be wathful for large (larger) sharp objects like that. Oh and way to rock that PR !!!! love how salesmen always find that way of getting the extra 15 -20 bucks out of ya. yet, i am sure it will be well worth the piece of mind. hey fun Jill meet up posting in Denver! Love reading Jills postings. Poor Lexa! Glad you were able to get her fixed up quick! I do not like flat tires. Period! The one time I went without my tire change kit, I got a flat. 5mile walk back later I swore never, ever to leave without it. But Lexa got a really nasty cut. Kevlar in tires? Wow! Who knew? 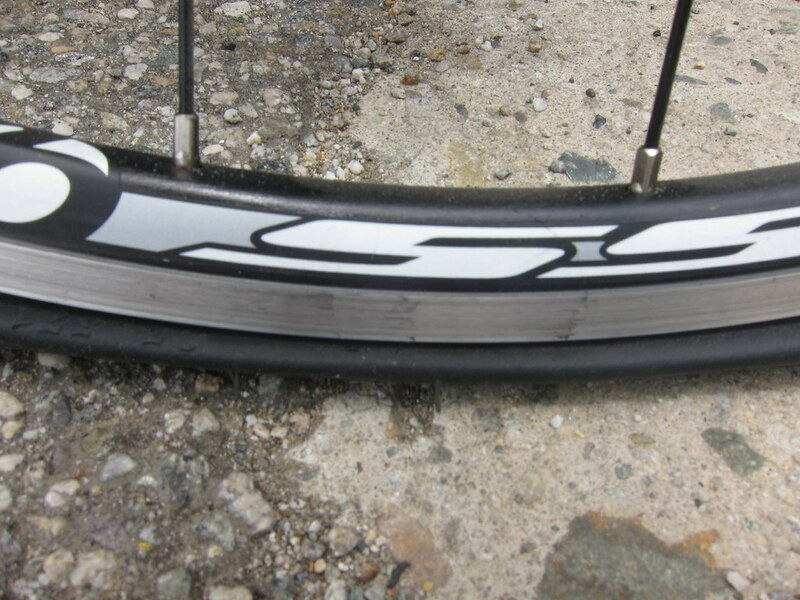 On my 10 mile run Saturday morning, I ran past a cyclist with a flat tire. By the time I ran a half mile, the cyclist had replaced his tire and whizzed by me. You might want to look into a tire repair kit. Sorry to hear you got a flat! I worry about getting a flat while out riding on my own. Hubs and I have kevlar tires and we both just had our first flats in 6 years of owning our hybrid bikes. Lexa is sporting a nice new tire! sorry that happened, but glad it was fixable! Oh my! I haven't had a flat yet and good thing because I haven't learned to fix one yet. Luckily you were near your car. Glad it all worked out and Lexa is new and improved! Wow, the whole tire was sliced! This usually happens to me on rainy days when debris gets washed into the street. I put tire liners in and they help.